Florida Keys Perfect Key West, Florida Bed and Breakfast. Find the perfect Key West, Florida Bed and Breakfast. Bed and Breakfasts and small Inns are a delightful way to travel. A bed and breakfast is a private home where guests are provided a place to stay for one or more nights. Sometimes, a bathroom provided for guests is shared with the owner and their family along with other guests. These days however, all Key West bed and breakfasts feature private bathrooms in the room. Breakfast is most often included with the price of the room. Key West, Florida is one of the oldest cities in Florida and boasts hundreds of bed and breakfasts and Inns. Key West is also the Southernmost City in The Continental United States and is a two by four mile, tropical island situated where the Gulf Of Mexico and The Atlantic Ocean meet. There is plenty to do in Key West for sun seekers. Visitors can enjoy water skiing, fishing, golfing, snorkeling, scuba diving, kayaking, boating plus simply relax in the sun on Key West’s gorgeous sandy beaches. There are dozens of attractions to see like The Ernest Hemingway Home and Museum, The Key West Lighthouse The Shipwreck Historeum, The Key West Aquarium as well as the world famous Mel Fisher Maritime Museum. Key West is also known for its’ array of restaurants and bars that feature fresh seafood, ethnic dishes along with live local music. How much does it cost to stay in a Key West Bed and Breakfast? will vary throughout the year. Room rates are the highest in the months between Christmas and Easter and also during special events or three-day national holidays. The main Key West festivals are Fantasy Fest, Key West Poker Run, Pirates in Paradise, Hemingway Days, Conch Republic Celebration and others including mini lobster season. There are deals to be had in the late summer and early fall (rainy season) and early December before Christmas is a good choice. No crowds and moderate temperatures plus low humidity. When figuring your cost, don’t forget to add on the local, state and bed taxes which are tacked on to all Florida accommodations. Where are the Bed and Breakfasts located? 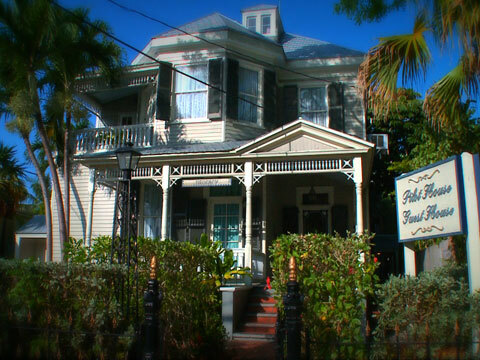 Most Key West Bed and Breakfasts are located in the older section of the city called Old Town. This is also called the historical district with buildings dating back to the mid 1800’s and is within walking distance to everything. If you are arriving by air, that means there’s no need for a rental car! Downtown (Old town) is the neighborhood surrounding world famous Duval Street, and encompasses much of the southwest tip of the island along Whitehead, Front, Greene, and Truman Avenue. Great ways to see Key West is by foot, bicycle, moped, electric car or Pedi cab. That’s the way the locals get around! The folks who own and operate the many Key West bed and breakfasts take personal pride in providing clean, comfortable lodging and are there to make your vacation in paradise truly memorable. Craig Grant Hollenback is Director of Photography, Vice President and co-founder of The Conch Republic Media Group in Key West, Florida. The company specializes in high definition travel video production, website design, hosting & site maintenance, digital photography and internet marketing. Informative, entertaining video episodes, provide the latest tourist information about The Florida Keys and Key West. Visit www.conchtv.com today.